Whippets – The breed standard describes them as ideal companions, extremely adaptable dogs. A lively sporting breed, but gentle, lovable and easy to live with. 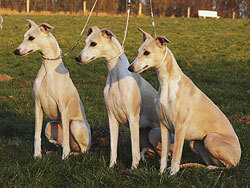 But there's much more to whippets. Feel free to browse through this and the other listed sites to learn more about Whippets and our Kennel OF GENTLE MIND. 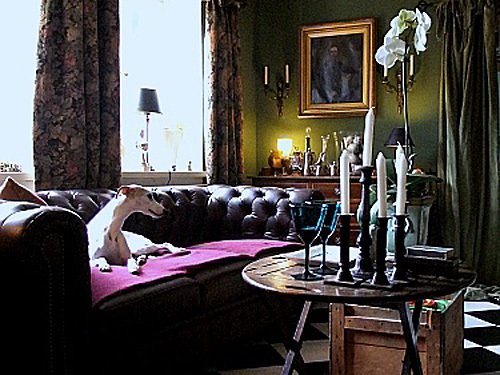 We share our large country house and estate with a pack of Whippets. They can play, run, race and always find time for sheer nonsense. Have fun browsing to the following sites! Yesterday Poetry of Gentle Mind, Quodlibet of Gentle Mind and Shalfleet Santée - our "Golden Girls"!